Nurturing a healthy lawn can provide some great family benefits, especially for parents and grandparents hoping to reincarnate some of the active lawn games they enjoyed as children. 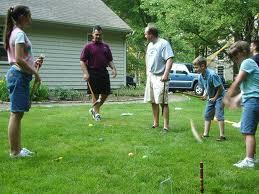 Establishing a healthy lawn can provide a new outdoor venue for families to re-learn the fun of lawn games. For those of a certain age, endless hours of capture the flag, tag, croquet and badminton marked the dog days of summer. Modern children have lost much of that unscheduled playtime with peers and seem to tend toward “plugging in” to entertain themselves. For many log home enthusiasts, their dream log home represents a chance to reconnect with extended family —to enjoy and experience the outdoors in ways reminiscent of their own childhoods. Tukey realized this difference in a radical way when his second child joined her 25-year-old sibling. Their childhood experiences were profoundly different— and the absence of lawn games in the current generation was remarkable. Another remarkable difference in the childhood experience is the rise of childhood obesity from one in 20 kids in 1972, to 1 in three kids living with obesity today. So Tukey set out to research simple outdoor lawn games, their origins and rules for play. He discovered that many so-called lawn games have deeply cultural roots. Some games represented a cultural anchor for some groups in ways that were impressive. Other games had a challenging mathematical component that added a little something extra to the mix. He also discovered that playing lawn games provided an outlet for kids to work together, learn to resolve differences and interact with family members of all ages. 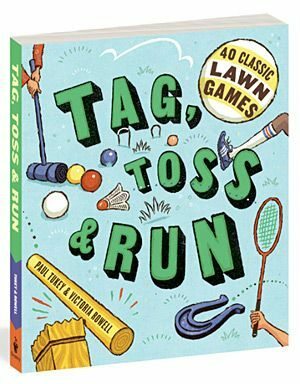 His book of lawn games features 40 games, many of which will be familiar to adults, but 13 other games that are unique, interesting and most of all, fun to play. Some games, like Cherokee Marbles have been played for more than 1000 years and are presently regularly played as part of Cherokee nation gatherings. Another tossing game from Finland called Mölkky requires players to knock down numbered dowels adding to exactly 25 points. If a player exceeds 25, he or she returns to zero. Even croquet or badminton are active family favorites that will get players moving and enjoying their outdoor spaces. Tukey emphasizes that “it is very important for parents to engage with the kids, to get them going with these lawn games.” Unlike his generation, where kids were sent out the door in the morning and called in a suppertime, today’s kids need to be provided some guidance to get the ball rolling. Adults and kids playing together can bring back some great memories and create new ones.